Not only is Facebook a great place for networking, it's also a prime location for attracting traffic to your website. However, if you are new to ads, then it's very likely that you will need a little help when you're first starting out. 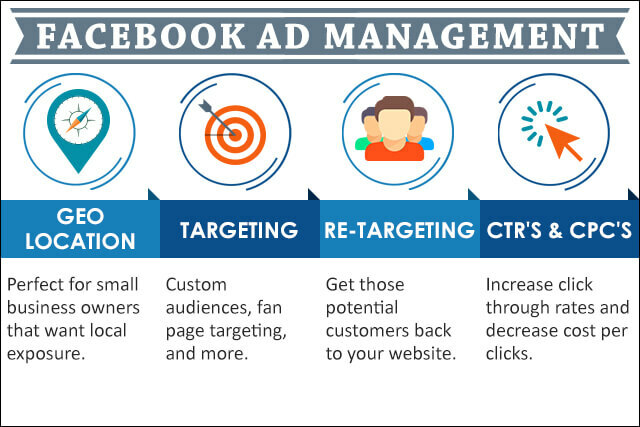 Here are just a few things that a Facebook advertising management service can assist you with as well as why these elements are so important to your campaign. Sure, you must be aware of how to manage your campaign, but this takes a thorough understanding of the metrics behind it. For instance, you need to know how to monitor your click through rates because this is the metric that will increase your rankings and give you an idea of how relevant your ad is to your target audience. You need to be familiar with cost per click, because this is the metric that will provide the cost of your ad based on the number of times visitors click on your banner. Similarly, CPM is another important metric because it will provide the cost of your ad based on the number of impressions your banner has. Also, custom pixels will give you to monitor the actions that people take even after they have clicked on your ad. You can see which device they saw the ad on and which device they ultimately converted on. While it's very important that as many people see your ad as possible, it's even more important that the right people see it. And this takes a certain amount of targeting. Targeting a custom audience ensures that you're getting the most out of your click-throughs. Not only will a targeted audience click your ad, they are more likely to become a loyal follower--and most importantly, a loyal customer. This is especially the case when it comes to small business owners who would like to target their local customers; by placing an emphasis on geographical factors, you can increase business phenomenally. Along with our Facebook advertising services, we also offer many other marketing services that work well in conjunction with advertising, including link building marketing, content publishing, and web design. The services work hand-in-hand with advertising to give you the best possible traffic that the internet has to offer. The idea is not just to have traffic, but to have quality traffic, and that's exactly what these services do. With any SEO program, it takes time to win the top search spot! Our Facebook services do a great job at delivering high quality traffic to your website within one week of signup. These are people engaged with your Facebook post and/or clicking straight over to your website to see what you have to offer. It's a great way to start the phone ringing right away while you wait for your organic SEO to kick in. Facebook traffic is also a great way to improve trust and authority, which helps with optimized search traffic.